This movie does a good job of combining satire with streamer fishing. Between family, work obligations and weather mishaps, as I get older I appreciate it when a fishing trip comes together. This last trip started out how most do. There has to be some sort of drama before hand. Usually it's a injury, family illness or the usual rainstorm which blows out all the rivers. The night before we were about to leave we had one of the worst thunderstorms I've seen since living in North Carolina. No matter which direction you looked there were strobes from lightning. We got about 3 inches of rain in 2hrs. I was still going on this trip no matter what. The clouds in the distance on the drive up looked ominous. They slowly subsided as we got closer to the property. The group rented a house with it's own private stretch of trout water. It was hard to know what to expect with the price we paid for the place. The water looked good at first glance. We wanted to jump in and fish right away but we needed to check out the house first. In my head imagined an older house with wallpaper and decorations that came right out of a 70's Sears Catalog. This place was awesome and included all the comforts of home even WiFi. We found ourselves constantly being surprised and yelling to each other "Hey, there's this too!" After all the oohing and ahhing we headed to the river. It was high and muddy from the recent rain. The area hadn't received the same amount that hit my home. We all figured with the fish seeing less pressure they'd be easy to catch. Our assumptions were wrong and the fish hit very subtlety. When the fishing was over we ate dinner sat on the balcony and admired the view. The next day the group decided to try our luck on a close stocked stream. The water had cleared and there wasn't a cloud in the sky. I love this river. It has some of the prettiest scenery in the state. If variety is your game this is the place for you. The creek runs the gamut of all types of trout water. Plunge pools, riffley runs, fast and slow water. Then there's post card pools like this. It's hard to fish with a frown in a place like this. We hit this river two days in a row and this dog managed to find me both days even on different sections of the river. This dog cracked me up. He wanted to be my fishing buddy more than a canine companion. At first I wan't sure how friendly he was and I kept my distance. Then I noticed he'd follow me to every section of the river and eventually walked a head of me leading me to the next spot. He knew some pretty good ones too. When the day was over I was more unhappy to leave his company than he was. He just sauntered off like he was eager to find the next fisherman to guide. The fishing trip was as good as it gets. With long fishing days, good food, campfire stories and adult beverages. I can't wait until the next one. We've all seen it and maybe even done it ourselves. A person on forums or blogs gives too much information. 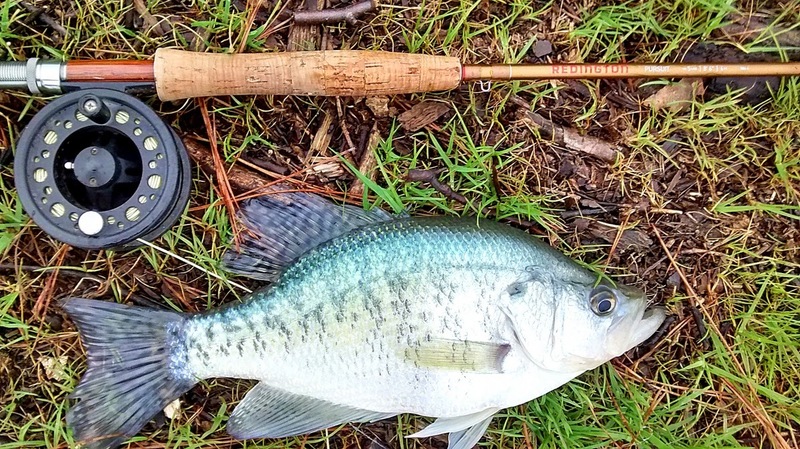 They share the location of great fishing spots and tell what flies and techniques to use. Usually these same people have the nerve to write about how crowded these places are. Fisherman are funny creatures and some love telling people about the fish they catch as much as catching them. The information is sometimes shared innocently with no intention of praise or recognition. People just want to help. Fisherman love to share the passion of what we do and have others jump on board. The problem is how much does what we share ruin what we love? It's a quandary many fisherman eventually face. What is the right amount of sharing? For me it's giving general information without the details. I feel the journey is part of the experience that makes things enjoyable. If someone holds your hand through every step of a process all the way to its completion is it really as gratifying as doing it yourself? Time and effort make accomplishing something really important. That applies in many aspects of life and with fishing as well. I think sometimes as fisherman we forget the recipe that leaded to a great day. The skunks, lost flies, wrong turns, bug bites, knots and falls. Don't take those learning experiences away from someone else by being a blabber mouth. These fish are very strange. I'd say they are the easiest fish to catch with a fly IF you can find them. That's the hard part. They will also trick you even if you do find them. One day they will hit every thing that touches the water. The next day you will not even get a bite and swear all the fish left the area. It's a cruel game they play but when they cooperate it's glorious. 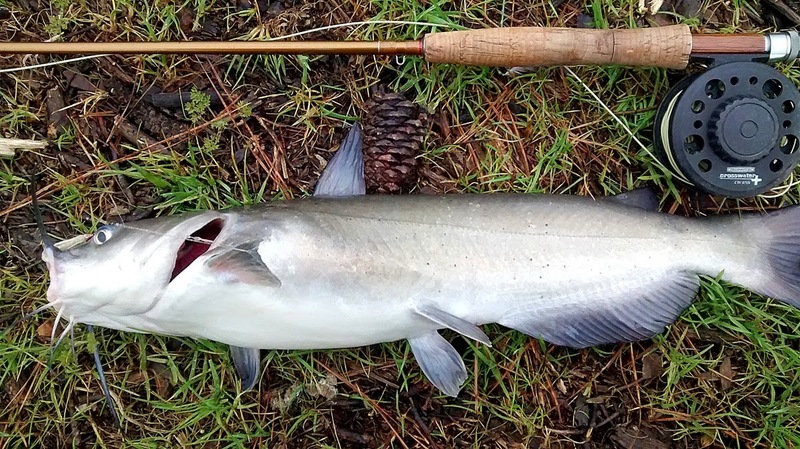 I caught my biggest the other day right at my feet. Such a different experience from when I was catching them before. I'd like to think it was staging for spawning but it was the only other fish I caught. Were there more fish and they just weren't hitting? Has the amount of fish fallen off? Who knows, I guess it's the enigma that keeps us coming back to figure out. 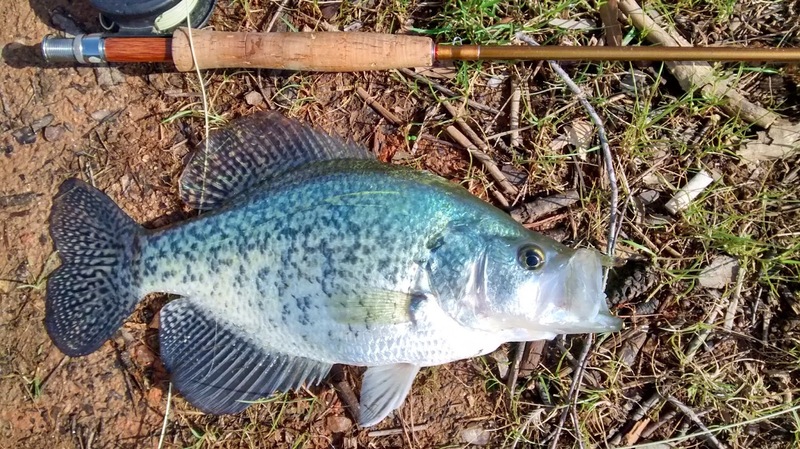 and these crappie were staging. Should only be a matter of time before they start filling in the shoreline. 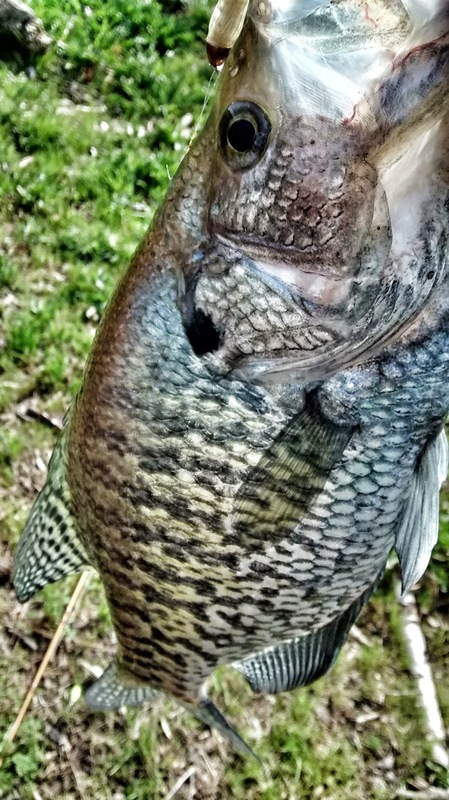 This crappie was so large I mistook it for largemouth. It has obviously been eating well. The catfish never surprise me but they do seem to have major feeding frenzies with temperature changes. I'm still trying to figure them out. I knew better. Wading the Haw is no joke. It's hard enough if you're in good shape and have the right wading boots. Couple that with dying light and panic and you have a recipe for disaster. When I hit the river the flow looked perfect. The water was clear for once and I figured I could finally fish this one spot I've wanted to for years. With my first few steps I became concerned with the amount of algae lining the bottom. I couldn't understand why there was so much. I thought the cold water from winter was supposed to kill this stuff. Had it grown back this fast already? It made navigating the uneven boulders slick. I was able to see the bottom and made my way to the rocks I had been eying. I figured the white bass had to be stacked up in an eddy right in front of these rocks. Several casts yielded nothing and the sun fell behind the trees casting a shadow across the water. I glanced back across the river and noticed I could no longer see the bottom. The problem with this there were several deep holes along the way to get to where I was standing. I couldn't remember exactly where they were. I figured I should start heading back before it got any darker. I was basically wading blind just feeling with my feet and the Haw is the last place where you want to do this. I would have been fine if I kept my composure but seeing where I wanted to be so close I started to rush my steps. I slightly slipped off a slanted rock and went down into a run knocking me off balance. I tried to give a good kick with my other foot in a attempt to jump over the run and hopefully hit shallower water where I'd regain my balance. This was a guess however. I couldn't actually see that there was shallower water anywhere near me. My guess was wrong and when my foot missed the ground I expected to find I started going face first into the water. The next few seconds were a blur. I remember see the sky then the tree line then the water coming at my face. I didn't totally go under, my feet found some ground just as I was going in. I did manage to soak my torso and splash water all over my face. I was happy to be upright and not floating downstream. I took two steps and felt this excruciating pain in my knee. Why are the worst injuries always the ones you never knew happened? I must have knee dropped into a rock when I went face first. I couldn't have hit the rock any more square with my knee cap if I tried. I ignored the pain until I got to a shallow spot where I could access the damage. I couldn't really tell how bad it was. It hurt like hell but I could still walk so I knew it couldn't be that bad. I tried to fish it off but the pain was impossible to ignore. When I stood still I was fine but I dreaded having to take another step. I called it a day. When I got back to the car I slowly shed off my waders and got a really good look at my knee. It was swollen but I've had worse. Hopefully less of my fishing trips will end with ice and ibuprofen.